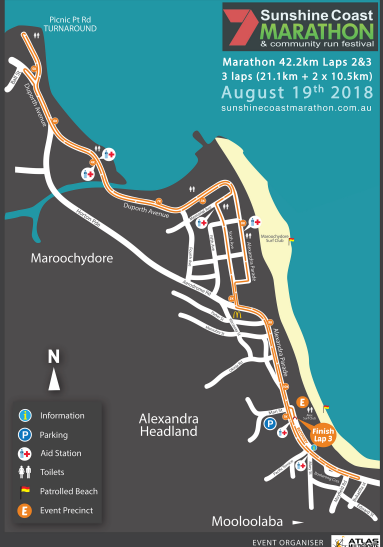 Race along the Sunshine Coast in this flat and fast marathon event. 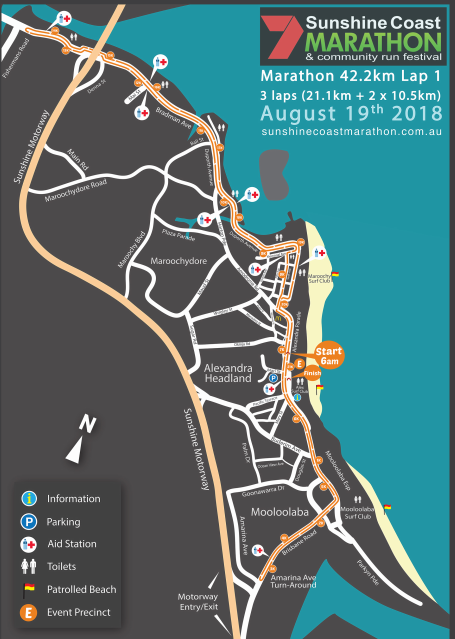 Great for beginners, this coastal course is a single loop within the Alexandra Headlands. Come for a personal best or a fun day out for the entire family. Participants must bring a photo ID or a copy of their registration confirmation to collect their race pack. You can get a friend to pick up your race pack as long as they can present the registration confirmation. 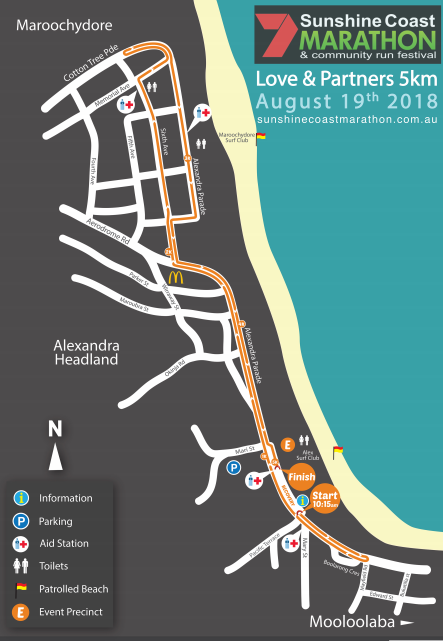 There will be changes to the bus routes within the race area between 4am and 1pm on Sunday, August 4. 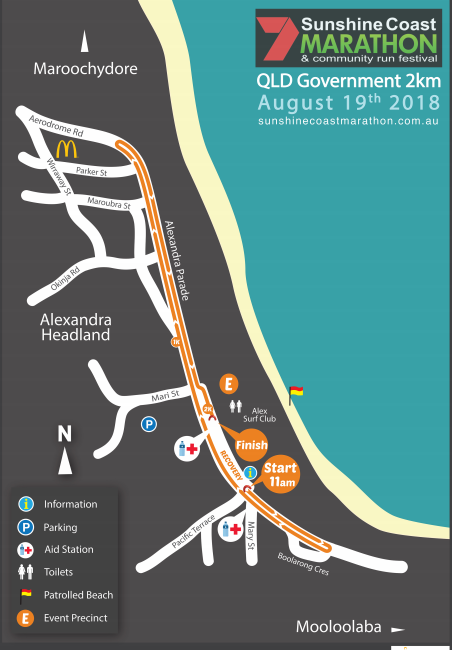 Participants are free to park in the car park on Mari St. You can access the the car park via left turn from Pacific Terrace onto Alex Parade and follow slip lane. There is also parking on Mooloolaba State School for $10. The best place for spectators to cheer on their racers is at the music and aid stations. Refer to the course maps for these locations. 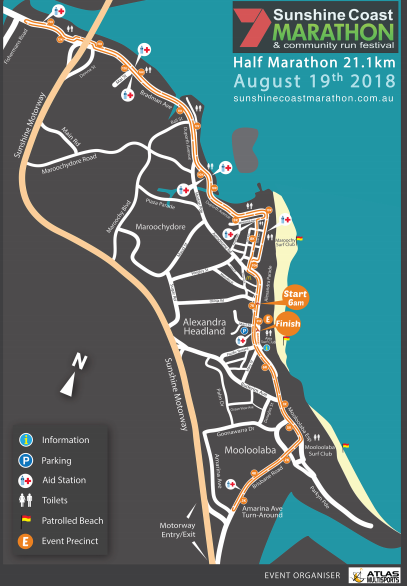 The Sunshine Coast Marathon Festival could always use more help. Group volunteers as well as individuals can also receive a donation towards their organisation and a t shirt, making this a very good fundraising method. Yes. Entries can be transferred to someone else very easily. Whoever intends to race, needs to bring a copy of the confirmation email to race pack collection to collect their bib. Once they have their bib, they need to bring it to late entries to complete the transfer. Transfers are charged a $10 fee. Yes. However, if you would like to change your race distance, it will be dependent on the race availability, and transfers will be charged a $10 fee. Yes. Participants of all races are allowed to run with a pram, but the race organiser ask that you start in the back. Participants are allowed to run with headphones so long as they are cautious of their surroundings. All participants must register for an event. If you are registered to participate in a different event from your child but would also like to run with your child, you do not need to enter twice. You do, however, need to pick up an armband of participation from the information tent. Walkers are more than welcome to participate in the 10km, 5km, and 2km events. Please note: All participants must be finished by 12:00pm, so it is important to be confident you will be able to finish your desired distance by that time. 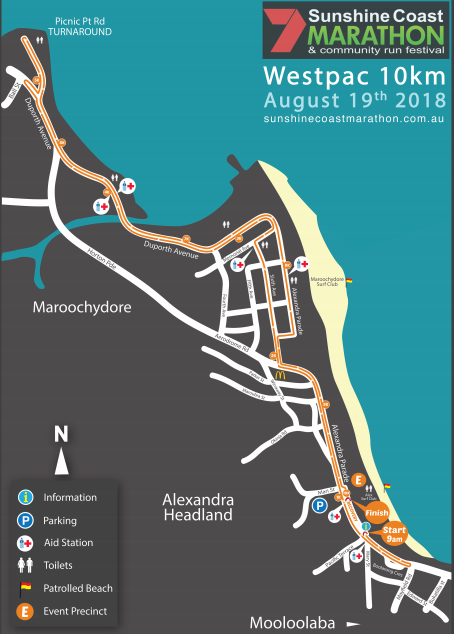 How was Sunshine Coast Marathon Festival?